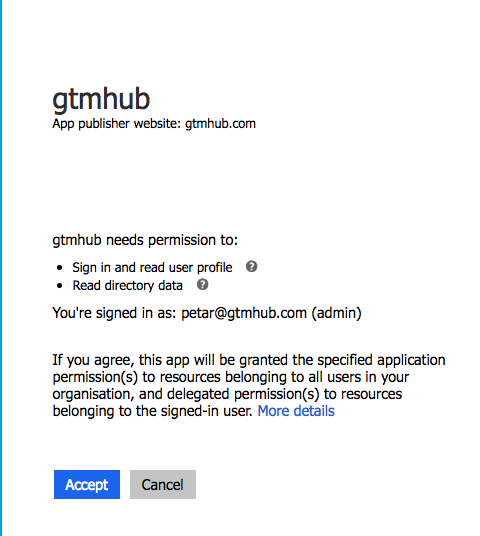 How to integrate Gtmhub with an Azure Active Directory Office 365 login. 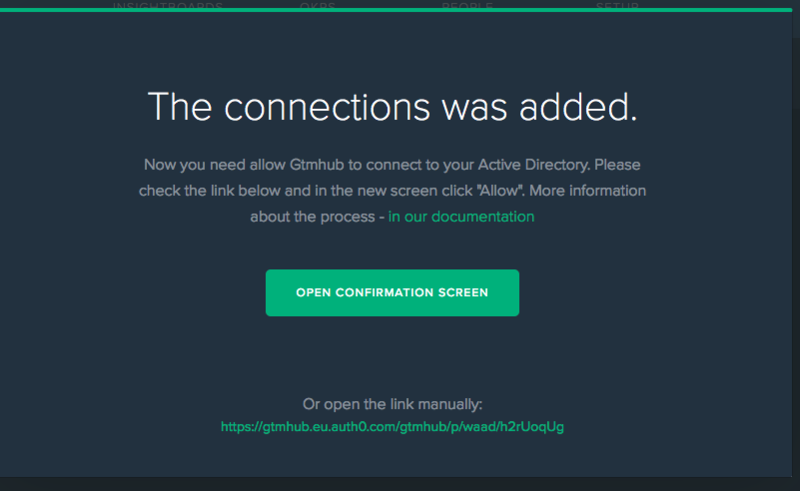 You can now connect automatically onboard all your users to Gtmhub. Active Directory is Microsoft's domain controller service. In case your company is using Active Directory to manage the employees you can now connect Gtmhub with Active Directory and automatically onboard all your users to Gtmhub. Enter your Active Directory domain. Usually that is the portion of your corporate email after the '@' sign. For example the domain name of [email protected] is 'example.com'. Now, you need to give Gtmhub rights to read your Active Directory information. To do so click on the Open confirmation screen button or send the link to your Azure Active Directory administrator to authorise the Gtmhub integration. If you have permissions to allow Gtmhub to read your Active Directory, you will see a screen similar to this one. Click on the Accept button. Once the connection has been successfully established, you will see your Active Directory connection in Gtmhub. Optionally, you can go here and map your Active Directory roles to Gtmhub roles. For example, you could decide that Active Directory role "hr" maps to Gtmhub role "admin", which theoretically will allow everyone in the company from the Human Resources department to be a Gtmhub account administrator.